I think Piacevole is fairly simple, comedy show that focuses on the female protagonist, Morina. She initially found a reclusive, Italian restaurant to be cute. She then was moved by its food culture, and decides to work there. A slice of life between her, her coworkers, and their customers. My only wish is to see each subtitle for ending they do. It looks like they vary and are contextual to the episode. It's nothing serious, but it's a cute little 4 minute series. I think the animation is actually pretty unique, lot's of light colors, it gives it kind of a watercolor feel. There's nothing really serious or deep here, but it's a nice way to waste 4 minutes every week. Fun, nice characters, easy watch overall. This feels a little like a mix between Food Wars and Wakako-Zake and as a 4 minute/episode anime, it doesn't overstay its welcome. The main characters do feel a little stereotypical though and the chemistry between the head cook and the main character looks like it will lead to a lot of typical fired up teenage boy and hapless heroine trying to keep afloat in a crazy environment type humor. That said, I enjoyed the first episode enough to give the second one a shot. I really enjoyed this show. I hope that it comes back with more fun and food! I think it used the short time it had well, and that you got to learn about the characters very easily. The art style is slightly different than normal, and the way they use colors goes really well with it. I found this a visually appealing anime ! Love it so far. Like a quick version of www.working!! with its unique staff and slice of life style. Looks like there is a main dish featured in each episode which is then shown IRL at the end during the credits. I like the funny chibi switching style. Piacevole is very cute. The episodes are 4 minutes long, but it doesn't feel like random bits of humor thrown together (as other short-episode anime shows often do). The animation is solid, feels polished, and uses a pretty color palette that gives the show a distinctive look. The characters are not anything particularly unusual, but they interact well and there's almost a reverse-harem here if you squint hard enough. There's not a very clearly defined plot, but it does sort of define itself as the show goes along. The last episode is an important flashback and is very satisfying, so I recommend watching it to the end. Of course, there's also tasty Italian food involved. It's a good little show. 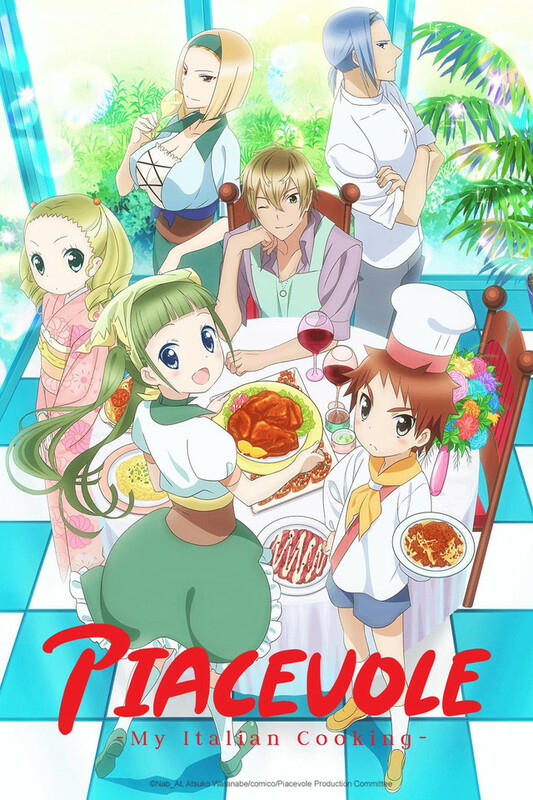 If you're looking for a food anime to binge watch, this is an excellent fit!